Something interesting happened today on Amazon.com… I was looking at one of my books and noticed my Author Rank is #84 in Business & Investing (one of the most competitive categories on Amazon). The funny thing? On the same page at #90 is Suze Orman, a celebrity personal finance author who published her first book in 1995. And who am I? Just some 25 year old kid who figured out how to sell ebooks on Amazon (it’s a lot easier than you think!). Me, an unknown, self published author who published his first book 8 months ago now sells more Business & Investing Kindle ebooks than Suze Orman. Suze has had a talk show for 11 years and done hundreds if not thousands of interviews on national TV and radio. Me? I’ve never been on TV or been interviewed on a traditional radio station (I’ve only done a few web TV, podcasts and online radio interviews). Suze has a huge PR firm and contacts with all the top media people in the country. Me? I use HARO (it’s free). Suze and her publishers have a huge marketing budget for her books. Me? I spend less than $100 a month marketing my 10+ ebooks. 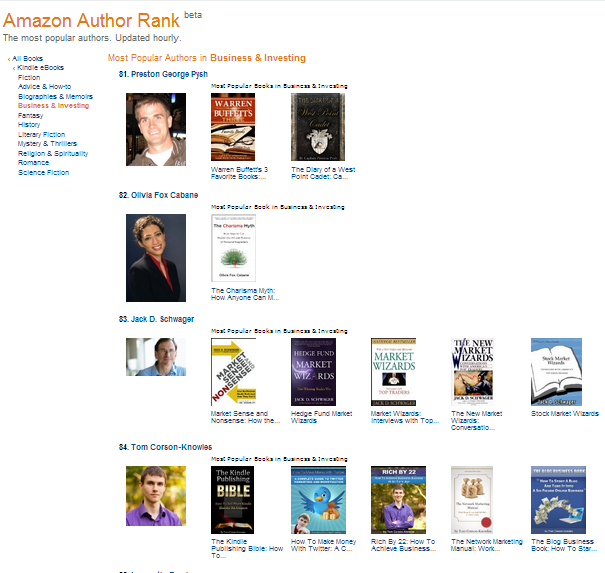 Suze Orman is at #90 in the Business & Investing Author Rank category for Kindle books. What’s my point? My point is ANYONE can succeed with ebook publishing today on Amazon. You don’t need a lot of money for marketing or book design. You don’t need a huge PR firm or to do hundreds of interviews on national TV or radio. You don’t need a publisher (you’re better off self-publishing!). You don’t need a “platform” or brand name recognition. You don’t need to have been an author for dozens of years. And it doesn’t have to be hard, either! Want to learn how to succeed as a self published Kindle author? I’ll teach you everything I know in my book The Kindle Publishing Bible now on sale at Amazon.com for just $5.97. Grab your copy today – it will change your life! Learn how to sell more Kindle books than Suze Orman!